34. County Map of Michigan and Wisconsin. Locating original landowners in maps has never been an easy task--until now. 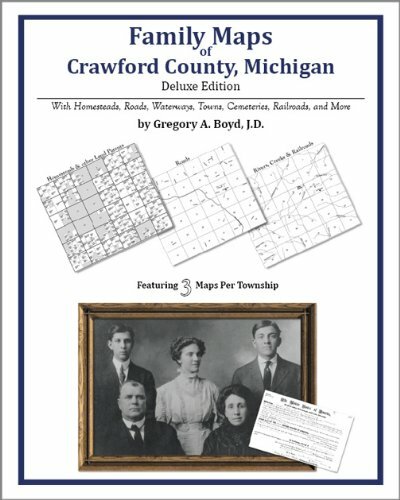 This volume in the Family Maps series contains newly created maps of original landowners (patent maps) in what is now Crawford County, Michigan, gleaned from the indexes of the U.S. Bureau of Land Management. But it offers much more than that. For each township in the county, there are two additional maps accompanying the patent map: a road map and a map showing waterways, railroads, and both modern and many historical city-centers and cemeteries. 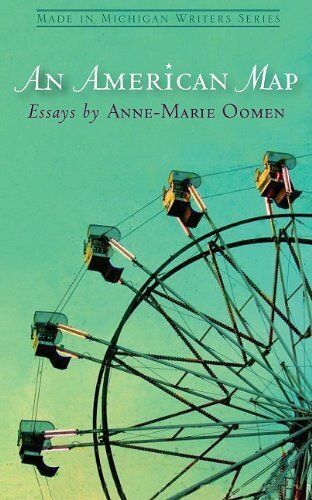 Ever since reading with great enjoyment and admiration Anne-Marie Oomen's first memoir, PULLING DOWN THE BARN, I have kept a sharp eye out for any new prose pieces from her. Her second memoir, HOUSE OF FIELDS, was another small treasure. I came away from both of those books with that feeling of having "gone to different schools together," probably because of a shared background of small towns, farming country and a Catholic upbringing. And yet I have also always felt just a little bit intimidated by Oomen's writing, which invariably shows a richly poetic, deeply feminine and a subtly nuanced sensibility and imagination which I despair of ever completely understanding. I guess you could say she got a whole lot more out those "different schools" than I did. Or maybe she's just smarter than I am. But I keep on trying to learn. In any case, I was pleased to learn of her latest offering, a book of essays called AN AMERICAN MAP. Glancing at the contents and the far-flung settings for each piece, I think I almost hollered, "Hot dog!" Because I have always loved to travel through books. In fact I'm pretty sure I enjoy book-travel a lot more than the real thing. It's so much more comfortable, ya know? The essays here were prompted by Oomen's travels over the past several years, and she has certainly covered ground: from Maine and D.C. in the east to Washington and California in the west, and as far south as Arizona and Puerto Rico with several stops in those middle places too, particularly her beloved home state of Michigan. Oomen admits early on in the collection that at least some of these trips were spurred by a sense of restlessness and wintertime "cabin fever." But she also speaks of a vague feeling of melancholia, sadness even, which she can't fully explain, but which had caused in her a dismaying case of writer's block. That sadness, that "weight of the world" comes through in several of these pieces, as she visits places as different as Mount Cardigan, New Hampshire, and Washington, D.C. in the essays, "Stone Wounds" and "The Underpass." Climbing that mountain in New Hampshire, making her way up steep slopes of granite striated with shiny streaks of quartz, she remembers a story told by Isaac, an old Native American she knew as a girl in her native Oceana County in Michigan. Isaac told her of a battle between the People before time began in which all were killed, but the battle was so great that the warriors, when they died, "turned to great dark stones, marked by lines of lighter horizontal color." Recalling this years later on a mountain side in New Hampshire, she writes, "... with my hands I touch a wide line of running quartz ... the lines identified the stones as warriors." In D.C. that same underlying sadness rises again to the surface when she is suddenly "undone" at her first glimpse of the Vietnam Memorial Wall. "All along that slick and momentous length are names that, from a step back, become human texture in stone ... I come close, touch the dark surface ... run my fingers down a row." Once again, lines in stone identifying warriors, but this time from a not-so-distant past, and part of the source of that ineffable sadness and "weight of the world" that sometimes threatens to overwhelm her. "As a child my male heroes were Roy Rogers, because he sang 'Happy Trails,' the Lone Ranger and Tonto, for reasons I can't remember, and my secret hero, Cochise, because I saw a movie in which he appeared in all the ways we would now perceive as politically incorrect ..."
This single line dropped me back into the air-conditioned darkness of the Reed Theater nearly sixty years ago, munching my popcorn as I followed the Technicolor saga of Indian agent Tom Jeffords (James Stewart) and his uneasy alliance with the war chief, Cochise, played by dusky-skinned actor, Jeff Chandler, in the film, Broken Arrow. And then my mind skipped ahead to the later TV series of the same name where Cochise was played by an actor of Syrian heritage, Michael Ansara. And speaking of Tonto, Anne-Marie, Jay Silverheels had a featured role in both Broken Arrow and its film sequel, Battle at Apache Pass. And while we're talking cowboys and Indians, if you and David had continued just a few more miles NE from Cochise, you would have come to Willcox, the home of "the last of the silver-screen cowboys," Rex Allen, where you could have visited The Rex Allen Museum. Okay, I know I'm pushing the parameters of what constitutes a review here, but I had my raggedy old Rand McNally out, as I always do when reading about far-away places, and there was Willcox staring me in the face. How could I not mention this? There might be some other old buckaroos and cowgirls out there reading this. And just to keep the record straight, I DO recognize that "Finding Cochise" is about more serious things than cowboys and Indians. I will, however, let other readers discover that for themselves. But while I'm at it, here's one other mostly irrelevant comment about another essay, "Squall," which might serve to embarrass Anne-Marie at least a little. In this piece about fly-fishing, Oomen is visiting her two adult sisters in Colorado, and, in a most uncharacteristic manner, she manages to use that four-letter word for manure at least four times in less than a dozen pages. It must have been something about being with family again that took her back to her farming roots. Her always practical mother, she tells us in a later piece, used to tell her children matter of factly that the smell of manure shouldn't ever bother anyone; that it simply "meant everything was working." An especially beautiful piece called "The River Inside (A Prose Poem)," with its ruminative stroll through an old church graveyard along the Huzzah River in Missouri, struck sparks of memory within me of a classic prose poem I studied eons ago in college, Edgar Lee Masters' SPOON RIVER ANTHOLOGY. Perhaps my favorite piece of the whole collection is the one called "Finding (My) America," in which Oomen travels to four different small-town libraries in northern Michigan as part of a book tour. She identifies herself as "a nerd for valuing books, for reading them, for loving to hold them, smell them and turn their pages, for revering the places they take me, as well as the places they are housed." Me too, Anne-Marie - book nerd extraordinaire. This easy-to-use Atlas provides the historical notes and maps of Michigan created by surveyors from the federal General Land Office (GLO) between 1816 and 1856. In addition, present-day maps have been overlain on the historic maps so that readers can locate the original forest and grassland types within Michigan today. This book affords readers the opportunity to see how areas throughout the state appeared to surveyors more than 150 years ago. 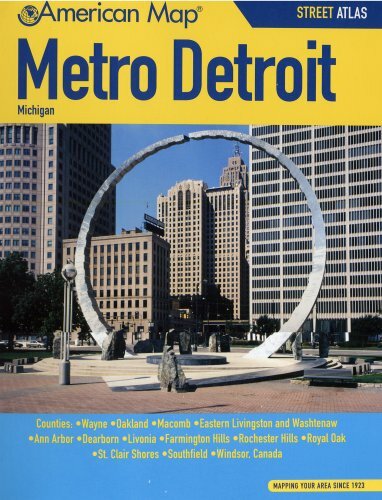 "A major purpose of this atlas is to provide current Michigan residents with a sense of place--as sense of the landscape in which they now live. Since this "landscape...is increasingly isolated from its ecological history," this sense of place related to its appearance is waning. The authors help to make up for this, however, by citing surviving areas in Michigan where residents can go to see what the landscape of their locale looked like before it was depleted by development. These areas of surviving landscape are cited in a section coming before the maps. 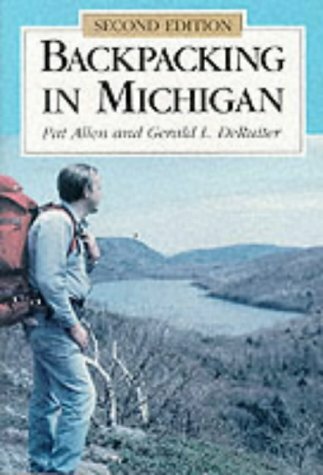 One would read the map having the place where one lived--or any other place in Michigan one was curious about; find what the landscape was like using the legend on the front or back gatefold (i. e., jacket flap; and then look at the pictures and read the descriptive text in the section. The legend having thirty different colors recognizes as many types of landscape or mixed types within the broader headings of water or wetlands and under uplands, open, woodland or savanna, and forest. Landscapes damaged by fire, beaver flooding, or windthrow are also recognized. 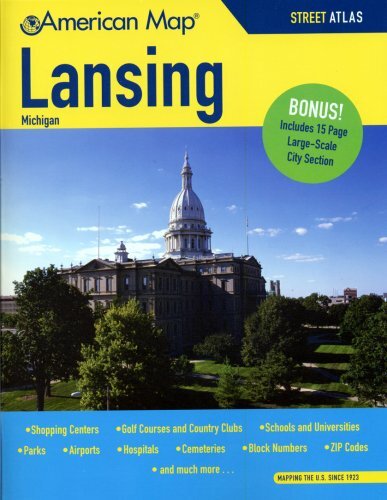 The 103 maps of parts of Michigan are modern-day maps with major highways, many secondary roads, cities and towns noted. The "early Michigan" landscape superimposed on these, so to speak, is from General Land Offices surveys done between 1816 and 1856 by the U.S. government in anticipation of land sales and settlement. Full-page in this folio-size atlas, the maps are quite detailed. They could be use to travel throughout Michigan though their purpose is representation of the early Michigan landscape (meaning types of vegetation for the most part). Secondary uses for the atlas, in the hope of the authors, are as a "tool for conservationists" and aid to historians in answering questions about settlement patterns. Regarding this latter interest for example, the General Land Office surveys likely account for the slow growth of the city if Detroit to the south. For they describe this land "as a broad and uninviting patchwork of swamps and wet prairies." What roads there were were impassable for parts of the year, and mosquitoes were rife in the swamplands. This well-done, smartly and economically organized, atlas is a model for ones that should be done for any state where 19th-century or any early-date surveys of landscape and vegetation are available. It is useful and interesting in a range of ways; and it documents much historical environment material from different sources. 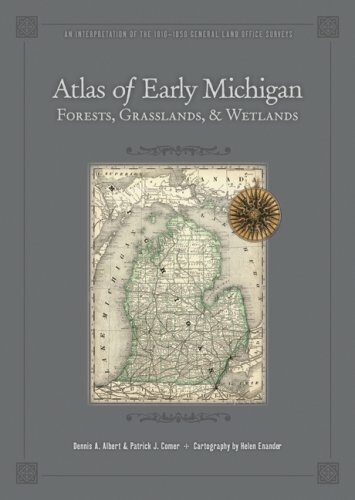 Atlas of Early Michigan Forests, Grasslands, and Wetlands is a softcover, king-sized reference of early Michigan's natural environment. Compiled from interpretations of the 1816-1856 General Land Office surveys, the full-color, full-page maps allow one to read the names of Michigan's criss-crossing roads. An introductory essay briefs the reader on Michigan's natural history, how the maps were made, and how they are meant to be used, but the bulk of Atlas of Early Michigan Forests, Grasslands, and Wetlands is devoted to the maps themselves. 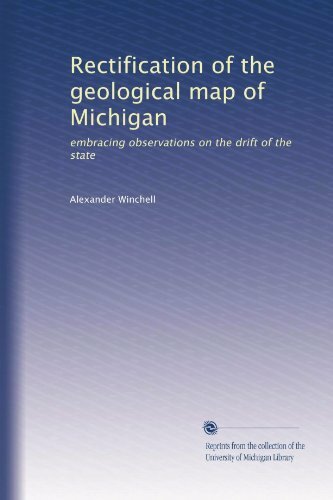 An excellent resource for anyone interested in studying the geographical and environmental layout of Michigan in the past, or for possible comparisons to Michigan in the modern day.